It’s about a week later than I was hoping for this post, but hey. Anyway, this one’s gonna be a lot shorter, since a lot of my thoughts from part one still stand. As always, spoilers for the last half of the series from here on out. The Good – I’m fairly pleased with how the new characters turned out (Rotwang, in particular), and it feels like they had more of a presence than in the original language. Granted, part of that probably has to do with, y’know, actually understanding the language this time around. Also, fairly huge props to everyone involved in the Kriem breakdown scene in the hospital. She sounded absolutely crazy at the end of the whole thing. The Bad – I’ve got one major problem: Samantha’s voice actor. It isn’t that the voice is bad (although she did sound suspiciously like Mrs. Garret from the Facts of Life), it’s that… You guys know the scene where she’s discussing the murder with Barnaby over the phone while he’s in Maverick’s office? Yeah, her concern or worry or whatever emotion she’s going for in that scene sounds entirely over the top and forced. I’ll admit that it kind’a ruined that scene for me and I stopped being able to take her seriously. Anyway, outside of that, it’s still probably the best dub I’ve seen in a long while. I would recommend picking it up whenever they release a complete collection, though, because unless you’re a huge fan of the series or some of the actors, it’s probably not worth dropping roughly 65-70 bucks on. Alternatively, if you’d prefer to do stuff digitally, NeonAlley seems to stream it, although I haven’t used the service and can’t vouch for it. Anyway, that’s all I’ve got for now. 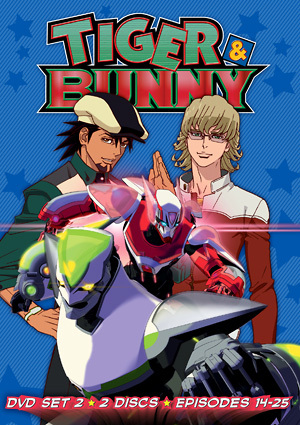 In the end, Tiger and Bunny was a damn fine show (if fairly expensive) and I really hope we get more of it sometime. As always, thanks for reading and have a good’un. This entry was posted in Anime and Manga, Review and tagged tiger and bunny dub review, tiger and bunny part 2. Bookmark the permalink.